OK, so the slow cooker version is not perfect, but it’s a great alternative to the hand-stirred kind. The original risotto cooking method requires about half an hour of constant stirring. Sorry, but I can’t really stand at the stove stirring constantly with a toddler on my hip or whining at me. And the result tastes surprisingly like the stove top method. Any springtime veggies would be nice in this. My favorites are: asparagus, leeks, artichoke hearts, and peas. I add the veggies in at the end rather than cooking them in the risotto (except for the peas, leeks, and artichoke hearts) so that I can control just how cooked they are. No one likes mushy asparagus. I like to serve this risotto with some pan seared scallops or sauted shrimp on top. 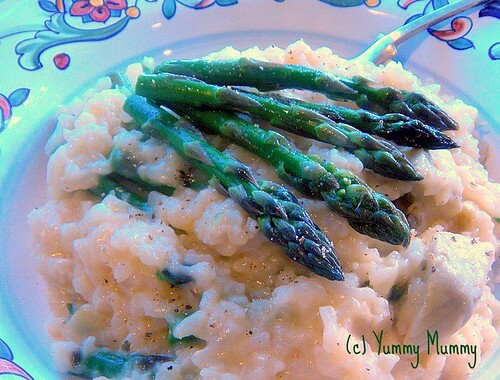 Recipe adapted from “Artichoke Risotto” from The Gourmet Slow Cooker cookbook by Lynn Alley. cooked small artichokes, quartered or 2 cooked large artichokes hearts, sliced; any other vegetables you like. Heat a large saute pan over medium heat and add the oil. Add the onion and garlic and saute, stirring frequently, for about 10 minutes, until lightly browned. Add the rice and stir for 1 minute, or until opaque. Add the wine and cook for about 10 minutes, until the liquid is reduced by two-thirds. Do not cook too long, or the risotto will get gummy. Transfer the rice mixture to the slow cooker and add the stock and artichokes, peas, leeks, or veggies you are using. Cover and cook on high for about 2 hours, until the rice is firm but tender. Stir in the butter, cheese, and salt. and pepper to taste just before serving. If using asparagus, saute over medium heat with olive oil, salt and pepper until tender-crisp. Stir into risotto. Transfer to a warmed serving dish and garnish with cheese. Serve immediately. This recipe looks good – can you add a print button?